In the United States, most households could benefit from conserving energy. By reducing energy use they also reduce greenhouse emissions and positively impact the environment. Families will also see the positive impact of their actions in terms of their finances. On average, people can save almost $2,000 annually on the energy that they spend in their homes. In households that actively take steps to be more energy-efficient, energy bills may be as much as 40 percent lower than other homes. The impact that energy has on a typical family’s finances is often a motivating factor in the decision to develop a plan to conserve energy. Thirty-eight percent of the energy used yearly in most homes comes from heating. By taking the right steps this can be significantly lowered. In every home, energy saving during colder months begins with setting the home’s thermostat. When the home is occupied, the thermostat should be kept at sixty-eight degrees during the day. When the home is unoccupied, during the day or at night, setting the thermostat to sixty is advised. 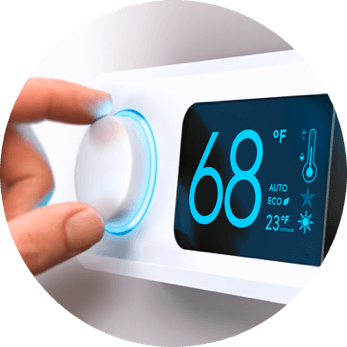 A majority of energy-saving experts recommend the use of a programmable thermostat that can make these changes automatically. When heaters are being run, monthly air filter replacement can help the heating system work more efficiently. People can naturally warm up a room by opening curtains on sunny days, even if it is cold outside; however, curtains should be drawn again during the night. Other common tips for heating efficiency include sealing heating ducts with metal-backed tape or mastic for up to twenty percent improvement in energy efficiency. To cool down the home more efficiently, there are certain steps that people should follow. Keep the house cooler during the day by closing windows, drapes and blinds to prevent the sun’s heat from entering the home. Windows that face the west should be shaded either by window shades or outdoor shade trees. Shade trees should also be planted on the southernmost side of the home. In the evenings, open the windows, curtains and blinds to let in the cooler outside air. Running whole house fans at night can also help draw in the outside air. Whenever possible, avoid turning on the air conditioning. When the air conditioning is on, it should be set no lower than seventy-eight degrees.